Few things capture the poker world's attention more than the high-stakes cash games that take place at the Poker King Club in Macau. While the game has been spreading for three years now – earning the distinction as the biggest in the world – it has been shrouded in mystery as few players are willing to talk for fear of being ostracized. One man who has opened up, though, is Tom Hall, also known as "Hong Kong Tom." Over the years, Hall has posted various updates in a TwoPlusTwo thread devoted to the game. Hall's most recent post came earlier this month when he revealed that the game had approximately USD$20 million in chips on the table! According to Hall, the short stack at the table was just USD$1 million, and the blinds varied from USD$4,000/$8,000 to USD$12,500/$25,000. He even included a picture (found below). 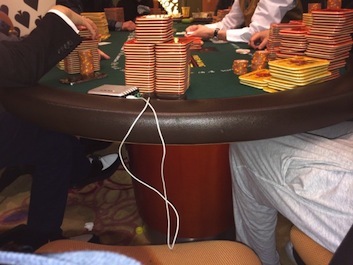 Around the same time, another photo taken by Poker King Club Macau Business Director Winfred Yu surfaced and revealed that Tom "durrrr" Dwan was sitting in the game alongside what appeared to be Alec Torelli. PokerNews was fortunate enough to speak with Hall, who should not be confused with the European Poker Tour player by the same name, about the big games in Macau. While he wasn't at liberty to go into specifics, he was kind enough to shed a little light on the clandestine game. 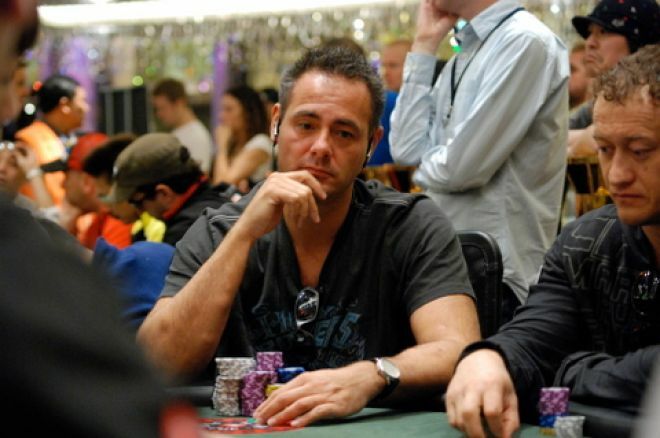 PokerNews: If you had to guesstimate, how many players rotate in and out of the Big Game? Photo courtesy of Tom Hall on twoplustwo.com. Tom Hall: I would guess since we started there has been somewhere between 100-150 players that have played at one point in the game. There is a core of 10-20 that play regularly at some point every month and three to four that play pretty much all the time they are in Macau. 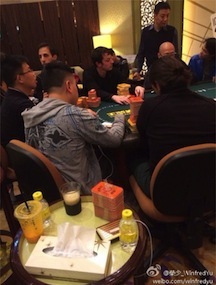 The lineup changes all the time, though usually the pros rotate with some frequency and locals — usually junket operators in Macau who hear about the game and like to gamble — frequently pop up for a few sessions. Is the game always played in no-limit hold'em? Yes, the big game is always hold'em. Some of the guys will occasionally deviate to PLO separately, but the stakes are much smaller. What is the networking process like? We assume it's not easy to get into the game. It all depends. If there are some brand new local players chancing their arm — guys that are very new to the game and relatively inexperienced — there can be a crazy waiting list even amongst the "regulars," whereas at other times if the core regular group are away on business or playing a high roller tourney somewhere else in the world, pretty much anybody is allowed as the remaining guys just want to play. It is a quasi-private game, so you shouldn't turn up and expect to be allowed to play, particularly as a pro. Pros are usually introduced through a pro that has played before or through Winfred Yu who organizes the games. Visiting businessmen are usually always accommodated! Does the language barrier ever cause problems? Any funny or crazy stories due to confusion? I don't think it ever causes any problems, but visiting players may find the amount of table talk going on in multiple languages throughout hands unusual. There is never any collusion through table talk. It's probably the fairest game out there and is vigorously self-policed by the table itself due to some of the quirks of the game. On the PokerNews Podcast, Greg Merson said that only one white player was allowed to sit at a table at a time. Is there any truth to that? I don't think it has anything to do with skin color, more whether the player is a pro or not. The same restrictions apply to Western or Asian pros. Again it depends on which of the regulars are playing and if there are new locals playing. I would guess overall an average would be one or two pros at a nine-handed table. Occasionally we play 10-handed but that's rare (not enough space due to all the chips on the table). Recently there were three Westerners playing (as I found out to my cost when I thought there was only two – see 2+2 thread). Along those lines, are there any rules outside the norm for those who participate in the big game? I wouldn't quite describe them as rules, but there are some nuances of the game that sometimes take pros or newcomers by surprise when they first play. Certain wealthy local beginners will request to look at a pros cards if they have folded to a big turn/river bet and the pros are pretty much obliged to show that specific player who will look at the cards and not comment further. This calls for a slight adjustment of strategy from the pros but bearing in mind they are still significant favorites they comply pretty quickly and it's all done in good humor. This is a throwback to the early days when, for the first year we played, everybody had to show every winning hand. It helped people learn faster in the beginning and also removed some collusion concerns guys had in the very beginning. Also when players are all in, the game can slow down as a side group offers "insurance" bets. This has been described at several points during the 2+2 thread so I won't elaborate here. Yes, there is vig charged but with the size of the pots involved, most people take it to reduce variance. Getting one or two outed on a US$1m+ pot can be a pretty sick feeling otherwise. As I have stated before, I think the insurance option removes a lot of the animosity/frustration that can arise from getting sucked out on and helps the game keep its friendly flow. I can't remember anybody ever calling time on anybody. If somebody is tanking, the other players will watch TV, play on their phones, walk off and chat, etc. Slow rolling is also not frowned upon either and is sometimes the cause of great amusement. One of the funniest I remember was when one player was all in, and the other tanks for ages, then gets up and goes to the toilet and is gone a good five minutes and then comes back to call with the stone cold nuts. This was all taken in good humor. What's the most anyone has ever won in a sessions in the Big Game? What's the most someone has lost? I would say approximately the same, around HK$100 million (~USD$12.8 million) won/lost in a single session, bearing in mind these sessions can run 30-40 hours regularly with perhaps a mini food break or quick nap or break to watch a soccer game. What I will say is that without a doubt the single biggest winner in live table poker of all time is one of the big game players who plays the Macau game regularly and some of the other big private games around the Region. This is not one of the established pros but any of the pros that play regularly will know whom it is. Not going to get into quantum or specifics but the Macau game formed the base for some pretty phenomenal winnings (and obviously losses). All of the local regulars usually play their own funds whereas most of the pros are either staked or pieced out to a certain degree. This is probably pretty smart taking into consideration the size of the games and the swings. Are the games still growing? Have they plateaued? Will they? That's a very difficult question to answer. I always say I think they've plateaued but then I hear about new higher stakes. However, for the past year I haven't heard of stakes bigger than HK$100K/200K blinds or a variation they played once with no blinds, just a HK$100K ante per hand. Which player or players would you credit with getting the Big Game started? Paul [Phua] and Richard [Yong] are probably the hub of the game and were there from the very beginning and Winfred Yu and his team do a fantastic job providing the best possible environment for the game and its players at the Poker King Club. The table we play at was moved from the originally designated spot (private area) to one that wasn't anywhere near as exclusive, but was nearer the toilets so players would miss fewer hands whilst away from the table. You don't have to name any names (unless you want), but are any players unwelcome in the Big Game? I don't think any individual is specifically unwelcome, but those super nitty, "silent at the table" pros are extremely unlikely to get a second invite back to the table. What's the minimum buy-in to get into the Big Game? This varies a lot depending on how long they have been playing, time of day, etc. It can be as low as HK$1-2m and sometimes it has been HK$10m. If blinds are at the low end HK$5K/10K, people can buy in for HK$1m though most would buy in for 200BBs (HK$2m) as the game plays much bigger than the usual blind/pot ratio you would see in most cash games. Next week, PokerNews will take a look at Tom Hall and his Macau origins in an in-depth interview, so be sure to check back for that.